DHE Goa Notification is out. 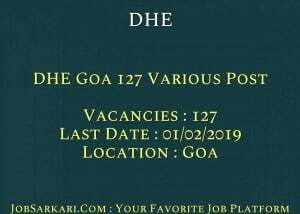 DHE Goa is recruiting for 127 Various Post Govt Job Posts. 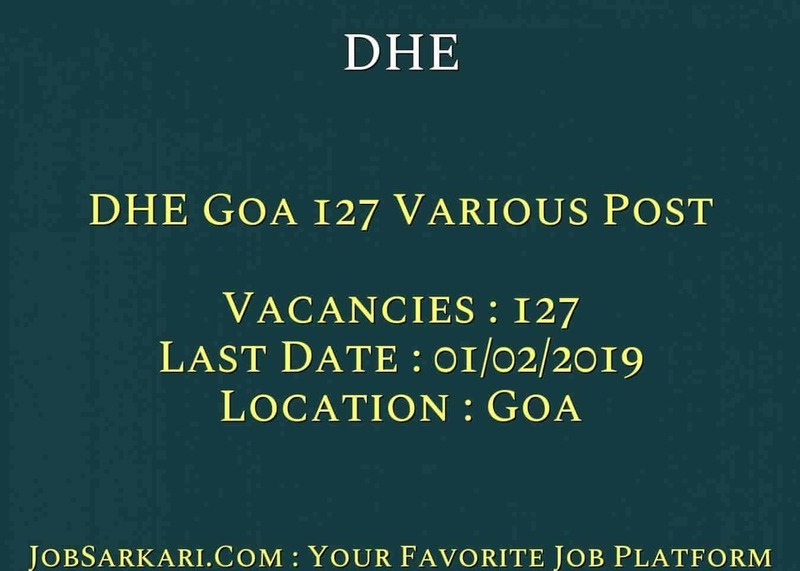 You can check DHE Goa - Department of Higher Education last date, download DHE Goa notification, visit DHE Goa official website and check other DHE Goa Vacancy details.Complete Vacancy and recruitment Details about 127 Various Post Govt Job vacancies in DHE Goa are provided below by JobSarkari.Com only for you. Last Date For Apply Online. 01/02/2019. Auditor. Candidate Must passed Bachelor of Commerce With Accounting and Auditing and Knowledge of Konkani and Marathi Language is Needed. 06. 02. 00. 00. 08. Jr. Stenographer. Candidate Must passed 12th or Diploma From Recognized University and Also Computer Literate. Candidate Also Knows shorthand and typing with 100 and 35 wpm with Knowledge Of Konkani and Marathi Language. 05. 04. 00. 01. 10. Lower Division Clerk. Candidate Must passed 12th or Diploma From Recognized University and Computer Literate .Candidate Also Have Knowledge Of Konkani and Marathi Language. 24. 10. 01. 05. 40. Multi Tasking Staff. Candidate Must Passed 12th or Passed Course Of Industrial Training Institute From Recognized Institution with Knowledge of Marathi and Konkani Language. 35 24 01. 09 69. Total Vacancy. 70. 40. 02. 15. 127. Goverment Servant. Maximun 50 Years. 3. Candidate Need to Fill Application Form With All Required Details and Need to Upload Necessary Documents as Prescribed Size And Format. 4. Candidate Need to Apply Online on or Before 01/02/2019. Q. What is the Last Date For DHE Goa Various Post Govt Job Vacancy ? A. Last Date for DHE Goa Various Post Govt Job Posts is 01/02/2019. Q. What is the Form Type of DHE Goa Various Post Govt Job Recruitment ? A. The Form Type for DHE Goa Various Post Govt Job Posts is Online. Q. How many vacancies are available in Department of Higher Education Various Post Govt Job Posts ? A. There are about 127 Vacancies in Department of Higher Education Various Post Govt Job Posts. Q. What is the Full Form of DHE Goa ? A. Full Form of DHE Goa is Department of Higher Education .